That quote means a lot to me. The first line means that you can only see things that are important to you with your heart and not with your eyes. It relates to our lives too. For example: your parents love and care for you because you’re their child, but you can’t see their love and care with your eyes. You can only see it with your heart because you know they love and care for you. The second line means that anything that is important is invisible through the eyes. If a story has an important meaning to it you can’t see it through your eyes. When you look at it, the meaning is more clear to the heart than the eyes because it means more. When you look at the meaning through the eyes than with the heart the meaning is just another sentence in the book. Overall, what this quote is trying to say is that we see the more important things more clearly with the heart than what we see with our eyes. The Fox and the little prince see eye to eye with each other but with different situations. Like whats special to the little prince and whats special to the fox. The fox wants to be tamed. But the little prince wouldn’t have time to do that. The little prince see’s differently to the flower than others to other people its just a flower to him its a best friend someone to share thoughts too. Just like the book Don Quixote. Sancho Panza see’s the world differently than other people. Sancho see’s the world as if it were an imagination but the story is trying to tell you you should rather see the world as a good place not a bad.It seems no complete since but it does make since if you get it. Just like the story the Little prince seeing the world as if no-one else could and not being a stereo type have a own group of people like the drunkards,business mans, vain man ,and king the prince doesn’t want to be any of those people.He wants to live life as it happens. I think the quote means one simple statement. People see things differently like how he see’s his volcanoes could still erupt if considered extinct we would even mind it and just go on with life and not worry about it. Also i think it could be saying just see things as they wouldn’t be seen in real life see them as a positive thing like and un-ordinary life. Like having the little prince see all of the other bushes of flowers he thinks his flower isnt special he wants to be special and not like anyone else and hes trying to say that a good thing not a bad thing. “One sees clearly only with the heart. Anything essential is invisible to the eyes.” That’s a quote that could really stump someone but, not me. What the quote means to me is that whoever you meet, you can learn all about them from their heart and what comes from inside of them. Anything else about that person we can’t really see. This is because you are supposed to be who you want others to think that you are. In other words, be yourself. The author probably put this quote in the book to confuse the reader. The book seemed more clear to me after I read the line. I think that along with being yourself, the quote also means to wait. Like another famous quote in the story, you should wait for everyone to grow into a butterfly. Not lose them as a caterpillar. Wait for them to sprout and become who they really are and maybe they will be even better. Also, I think seeing the natural aspect of someone would be essential. You need to look deeper though. In the heart, you will find the person inside of them; their true beauty. It’s all about seeing the best in others. Other stories I have read do the exact same thing. One example that popped into my brain just by reading this quote is Twilight. Bella sees the true beauty in Edward, the ugly disgusting vampire who eats people. Yeah, those movies were pretty cheesy but, that’s a good example to compare with the quote. To wrap up, I want to say that the quote is probably the most famous line in the entire piece of literature. Many people would understand the quote and be like “Oh yeah, I totally get it!” but, they don’t. See, you have to find the real true meaning. I can compare this quote to real life because I have a friend who can be really mean and obnoxious but, I can’t just give up on her, I have to wait and see her become who she really is and if she doesn’t change her ways, oh well that’s her lose not mine. For me, this quote means exactly what it says, look inside someone and let them show you their natural beauty. I think it means that whenever you love something that is the only thing you always see. Maybe every time you see something, it will remind you of what you love. If you have a favorite teddy bear or you like someone, everything reminds you of it. But everything else doesn’t matter. You might look at a beautiful tree, and just think, ” Oh, it’s just another tree.” But it’s not. You need to look at everything the same. You can’t look at something and just think it’s ordinary. You have to look at it closely and see the beauty in it. That’s what I think of the saying from the little prince. I feel that this quote has 2 important meanings. The first definition of this quote is that you may be able to love something so much, and no one else can see it. Another important meaning to this quote is that one can see potential in someone, while other can not. Showing that all of the major people that are talked about( the essentials), don’t always have to be the big hit. A good example of the first meaning is your family. You love them automatically, but it’s not the same with your friends’ parents. You don’t have that connection with them, and much less do you probably want to. An example from “The Little Prince” of this meaning was when the little prince realized that out of all the roses in the world, his rose was the one for him because he took care of it and loved it. For the second definition of the quote, there is a great movie that represents it. The name of the movie is “Moneyball”, and is based on a true story of a group of guys that take in players that are not wanted, and win 20 straight games, a league record. In addition to that, in the book, the little prince tames the fox when everyone else tried to kill it. That shows that the quote is definitely true. The quote; One sees clearly only with the heart, Anything essential is invisible to the eyes, means to me that everything good about a person is what you recognize, and the bad is dispersed. Like if a friend had cancer. When you’re with them, you look on all the positive things they’ve done or their top qualities, and not that they have cancer, and might not be looking on the good of everything. Right now I’m reading a book called Drums Girls and Dangerous Pie which is a story about a 7th grader named Steven who;s little brother named Jeffery has leukemia. Leukemia is basically just like cancer. All of Jeffery’s friends at the hospital look on how positive and friendly Jeffery is. My mom also recognizes the good in people.All of my bad qualities are gone with her. When I don;t do very good in a volleyball or softball game, my mom is there telling me what I did pretty good that day. This quote is very important in the story the little Prince and it is also important everywhere else. The Little Prince is a great book. The most important line in the book is,”One sees clearly only with the heart, anything essential is invisible to the eyes.” That means the little prince’s fox, flower, or prince is more special than any other because you know that item. None of the others are special because you’ve known it for a long time. “One sees clearly only with the heart, anything essential is invisible to the eyes.” The little prince has tamed the fox which makes them feel special together. The fox is the only fox in the world to the little prince. The little prince is the only prince or friend in the world to the fox. When the little prince finds a whole bunch of flowers in the story he gets upset and sad because he thought that he had the only one flower in the whole world. My family is very special to me. If a lot of other families showed up and my family was there to only i could know how special they are. The other families are invisible because I don’t know them. That quote means to me that you see things differently from other people. Like The Little Prince, he only sees his special flower the way no one else can see it. Or how he tamed the fox and now they are good friends. I think it also means to take advantage of what you have or what you can see they way you see it or have it. Like if your mom and about 10 more moms were in the room, you would only know your mom and all the others would just look like normal ladies you don’t know. My next reason is to not pass something up that is special to you. What I mean is the Little Prince didn’t hurt his flower, or dig it up, because he knew that it was a treasure or a special possession to him. I would never do anything to my brothers, because they are not like any other brothers, because they are my brothers. One last inference I had was, in Toy Story. Woody would never do anything to Buzz or any of his friends because they are special to him in his own way. My last reason is to love what you have. If you had a dog that you liked so much and played around with him every day, you would love that. Then the next day he ran away as you were playing with him. You would start to get sad and try to find your dog. He would never come back though. That’s why you should love everything you have. The Little Prince, he loved his flower so much, he protected it with a screen, he watered her, and when he left he put a glass cover over her. So what I’m trying to say is you shouldn’t take things for granted. You should love things that are the closest to you,and accept them the way they are. The quote is by Antoine De Saint-Exupery the author of The Little Prince. The quote goes like this “one who sees only with the heart , anything else essential is invisible to the eye”. This quote means a lot to me and when you think about it, and hold on to this quote it helps in life. Like Mr.Curtis said I would say my mom is better than your mom because she is a one of a kind to me because she is my mom. But if I thought of some random kids mom I wouldn’t really care about her, she would just be a random person. It would be this way because I see my mom with my heart there for I would see the random kids mom as something essential. In the story The Little Prince the fox wanted to be tamed. When your tamed you become one of a kind to that person but when your not your like any other ordinary person. Taming means to create ties between you and another person, basically to have a new best friend. This is what I learned from this quote. I think it means that if you only look with your eyes than you wont see what is true about that person or thing. If you only look with your eyes part of the answer will be clouded to you. If you look too closely you wont see what is most important in the picture. if you look with your heart then you will notice things that are invisible to the eyes. you will see the good in people. you will no longer see only the bad in other people. if you really want to get to know a person than you should look with your heart. if you only look with your eyes than you will never see the good in people other than yourself. if someone seems like a bad person than you you should stop looking just with your eyes and start looking with your heart instead. That last one is what the quote means to me. It means it doesn’t matter if the qualities of the people closest to you are good are bad, don’t waste them. You shouldn’t waste them because nobody knows how long they will live. And if in the future, you outlive the people closest to you, and you wasted what makes them special, you’ll only bring more sorrow upon yourself. If you don’t waste those special qualities, you won’t miss those people as much when there gone because you’ll have those memories of what kind of things they did and what kind of person they were. You’ll remember the special things. In other words, the quote could also be another way of saying, ”live life to it’s fullest”, or ”be fun”, or ” talk to people, tell them what makes them special to you. Tell everyone what what makes that person special to you, because only you can see the special in that person and only that person can see the special in you, but you have to ”tame” each other first. No matter who that person might be, they’ll appreciate it. After you ”tame” someone, you form a bond. That’s when you see the special in each other. That’s also when you tell everyone else about the bond and the special. And then those people will see the special and soon, everyone will see the special in each other. That’s the day when everyone’s wish of world peace, comes true. ” One sees clearly only with the heart. Anything essential is invisible to the eyes.” That sentence might be confusing to you. That sentence to me means, some people may seem special to you but not everyone. That is saying I think my mom is special but to other people she is just some lady. In the story the little prince thinks his flower is more important to him than any other. That’s where the saying ” One sees only with the heart.” He doesn’t like any other rose. And that’s where the rest of the saying makes since, ” Anything essential is invisible to the eyes”. The little prince also thinks his planet is way better than anyone else. He lives on his planet everyday so he loves it. My family is special to me because they are my family. But to others they are just random people. 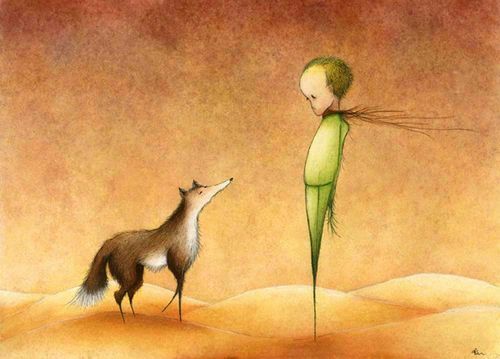 Since the Little Prince tamed the fox, they have a special relationship. After the little prince tamed the fox, he just was going to leave. The fox stopped him and told him his secret. The little prince said back to the fox, you aren’t special to me. My rose is what i care about. That tells me, somethings can be special or cool to you but, the person next probably won’t think the same thing. In my opinion this quote means many things to me. I feel like it means that if you see with your heart anything and everything is beautiful and happy. But if you look with your eyes and do not use your heart the world won’t be as wonderful as it was when you used you heart. To feel with your heart isn’t some illusion of a fantasy land but it is the true beauty and love in life. For example the little prince felt like his flower wasn’t important anymore because he saw other beautiful roses just like his own. That was the little prince seeing with his eyes not with his heart. Through out most of the story the little prince find light inside the darkness and is loving and compassion it person. He shows understanding and feeling for people like the king and the drunker. And when he gets his gorgeous rose he said you are the only rose in the world you are my rose. That’s an example of him seeing with his heart not his eyes. So, the world can be seen in to very different ways. Your heart can see what’s invisible to your eyes. So, that’s what I think the quote means. Skylar, I agree with you. We kind of wrote the same thing. You should always think about whats in the inside and not the outside. The phrase “one sees clearly only with the heart. Anything else essential is invisible” means to me that you only see things you know or tamed. For example in the Little Prince The prince sees his flower as special. He sees his flower as special because he has been with it and talked to it for a long time. Some body else who doesn’t know the flower would see it as just another flower or nothing. In the real world this happens also. When you have a pet you lots of times think your pet is part of your family. To your he or she is special. For example a dog. You feed you dog and play with it. Some times you watch TV with it too. You’ve crated a friendship with your dog. When you are walking it though other people see you pet as just another animal that an owner is walking. Another example in the Little Prince is with the fox and the prince. The prince is taming the fox so the fox will see the prince as his owner and the prince will see the fox as his fox. So the fox will see all other boys different from his master and the boys will see the fox as just another fox. The only one who sees the fox special is the prince. To me, the quote means that what you see as special, nobody else in the world can see it. Like my mean cat, none of my friends can see what is so special about her like my sister and I do. That saying also goes for how I love manga. Only so many people that I know love manga like I do. Other people seem to say it’s stupid. I guess they just don’t see the amazing part of it. This is sort of how my dog is special too. My friends love him, but when other people look at him they just see an ordinary black and white pit bull. When I look at him though and see him act like the oddball he is, I see a little brother who is very weird. My mom, I bet, when she looks at him she would see him as a third son, with a lot of fur. Speaking of parents and children and such, parents can relate to the fox’s saying too. A parent, or anybody really, can lok at some kid and say, “I don’t care.” But the parent of that child would see them and say welcome home, or their heart would just fill with joy and happiness. For example, if there were a house fire with 50 children inside including that parent’s child, they would immediately go for their son or daughter first. Nobody else in the world besides that child’s family can feel the love that parent has to offer. “One see’s clearly only with heart anything essential is invisible to the eyes”. I think it means that that the heart is the like the bad person radar. The heart before the eyes judges a person by words and actions where the eyes judge on look’s. And according to the heart look’s can be very deceptive. But can one’s actions and words be deceptive, I would think not. It is like buying a dog at the store. It’s the cutest bestest greatest super fluffy thing on the planet and you now have to have it. But you pet it and it bight’s you. Your mom picks it up only to find the sting of a vicious terrible dog. Suddenly once simply amazing features seem to be gone. You see meanness and hate in this dog. The heart’s judgment of this dog’s action has overruled all his looks and you do not like or understand what you did like about that dog. To me, the quote means that someone can only see something in a person with their heart. But anything like what a person looks like is invisible and the only thing you see is what you think of the person. So, the Fox looks at the Little Prince with his heart and can see whats good about him, or he sees whats so special about him. In the Little Prince, the Little Prince has a particular flower that is very special to him. Later in the book, he sees many more flowers and believes his flower is no longer that special. But then the Fox told him his secret and the Little Prince realized what he sees in his flower is what makes it special to him. In the real world, people see their family and friends as special, but people who don’t think they’re as special as their family and friends. This is because if you think your family is special, you use your heart to find a reason why. But if a stranger didn’t find them special, then they either don’t know them or use their heart to find something else about that person, and so the person will strike different people as different things. That quote, to me, means that what you feel is more important then what you can see. Even if you can’t see someone you still have the memory of them. When you can’t see them physically, they are “in” your heart. No matter how far away something may be you can always feel like they are close to you if you think about them. There is this “rope” that keeps two things linked together. It will stretch, it will rub, and it will get tangled up but one thing it won’t do is split, break, or tear. The rope will always be there holding things together. Like if two people love each other, you can not see it. They may show signs they love each other but you can never actually see that love is in the air. That saying, “love is in the air” is not fully correct. Love may be in two people but you can not see that it is there. There is no pink and red cloud of love that surrounds two different people if they love each other. The only thing that can feel if you love someone is your heart. You can tell somebody and they then know about it but they cannot feel your love. One really good example is from my life. Before I moved here I had a best friend. Her name is Aubrey. We had sleepovers every weekend. And then after school she would come over. The move was to far away for her to come up that often. It was four hours away and making that drive would end up being an eight hour trip. Now she can only come up every once in a while and it takes days to figure things out. Not to mention that we have to find days we both have off. It takes a lot of planning to have her come up. but even though she is hours away we still have each others memory. We know what we look like and what we sound like. We are still friends because of that “rope that ties us together. No matter where we go we are tied together. Well I take this quote as, there are millions of people, flowers, animals, etc, but only the ones that are close to your heart, are different from all the others. All the others are just another face, or animal, etc. The little Prince had one flower. It was a rose. His flower told him that she was the only flower like her in the universe. When he found more roses, he felt that the flower had lied to him. What the flower meant by she was the only flower like her in the universe, it was true. All the other flowers meant nothing to the little Prince. This is the part where it made me realize what the quote fox said meant. For example, I have two dogs named Miko and Missy. To me, many other dogs in the world can not compare to Miko and Missy. Missy gives smiles to me when she comes to greet me when i come home, and Miko is just a crazy dog. I would say my dogs are the best out there. Many other people would come and disagree and so “no my dogs are the best.” That’s because they do not know my dogs and have not had them their whole life. My dogs are not close to other peoples hearts because in their eyes, they would be just another dog. They would most likely have their own dog that is close to their heart. Everyone has a different meaning for the quote. Like me I have my own meaning. Well i think it means that there can be more than one of something but you will always have your favorite. Say when you were little and you had a favorite toy bought from a store. There can be other toys the exact same as yours but you will think yours is better. That’s because you grew a connection, a relationship with it. It means just because there are more of them, it doesn’t mean yours is bad. It’s saying that yours is unique. Everyone has a different thought on something. Say you and your friend have a bother. You will say your brother is better. While your friend will say his is better. That’s because everyone has a different opinion. Also with the toy, if you see another one you won’t see what you do when you look at yours. The other one has no meaning to you. Except the one that you connected with. There is only one that is special to you. Just like how the fox is special to the Little Prince because they connected. The Prince is special to the fox because they connected. That means that the fox has no feeling for any other boy because he already connected with one. That’s the same with the Little Prince too. I think what the fox said, everyone can relate to. In my opinion I think the fox is trying to say if something is special to you, but someone else doesn’t think that way don’t let them take away what you think of that person or thing! For example the Little Prince thought his flower was different from every flower he loved that flower and treasured it. When he came to earth and saw flowers just like his he became sad because he thought his flower wasn’t special anymore! Once he talked to the fox all that changed and he realized that was his flower and he watered it everyday and that flower was special and no on could take that away from him. This quote can also mean someone or something maybe special to you but someone else doesn’t see why it is special because they don’t really know what that person or thing is like. For example you may think your dad is better than mine but I think differently, and I would say my dad is better. I would say that because I don’t really know your dad but I have known mine for my life so He is very special to me! Each family has their own bond no one can break, meaning personally I think my family is better than anyone else’s family because I know who they are and their personalities, and they mean something very special to me but other kids would think differently. The quote the fox said can also relate to Toy Story 2. When Woody gets kidnapped and Jessie, Bulls-eye, and The Prospector want him to go to a museum in Tokyo to be displayed with all the Woody’s Roundup thing he said no because he needed to get back to Andy. This made the three upset because they thought Andy will never play with Woody when he is grown up so what is the point. Jessie got mad because she got left in the fields by her “kid” and she believes they aren’t worth it. None of them understood what Andy meant to Woody, only he did because Woody spent years with Andy and no one could ever take that awat from Woody and Andy! The quote that the fox told the Little Prince can relate to many things. In my opinion, this quote means that someone may seem very special to you, but not to everyone else. For example, the Little Prince thought that the flower on his planet was much better than any other flower, because it was his flower. That was the only flower on his planet, so to him, it was one of a kind. Also, you might think that your parents or grandparents are better than anyone’s family, but you don’t actually know for a fact. It may just seem like that because you really love your family, and you will never love anyone’s parents if they aren’t yours. Every other family just seems like strangers walking by you, and that’s not the case to everyone. Everyone loves their family, but they won’t always be the same people as you. They haven’t seen how nice or loving your family is. Another example would be Toy Story 3. Lotso just thought that Andy was just like every other kid he’s seen. The one’s that forget about their toys forever, even though that wasn’t the case with Andy. It’s just that Lotso thought his owner was like that. Woody and all of Andy’s toys didn’t feel that way about him in the end. To them, Andy was a caring person that would never get rid of them, no matter how long it may have been since he played with them. Lotso just saw the same person he thought his owner was in Andy. As you can see, the quote, “One sees clearly only with the heart. Anything essential is invisible to the eyes.” can relate to many things. Many people see this way, and always will. I think the quote means that seeing with the heart is the way to see the best in others. Maybe you like to do one certain thing and people make fun of you for it. It does not matter. If you like it that is all that matters. If it is not special to others, does not mean it is not special to you. The little prince’s flower it was special to him but, when he came to Earth he found out that his special flower was just a plain rose. He wept and was not as positive as before. When the fox came along and asked the little prince to tame him, he learned a valuable lesson. It is his flower and it very special to him. It does not matter if there are one thousand more roses in the world, that one tamed him and is his. As I quote from http://theliterarylink.com/prince.html, “the image of a rose shining within him like the flame within a lamp”. You can not see what is necessary with your eyes. Your eyes are not as pure as your heart. Only your heart can decide what is right for you. You are special no matter what. You can be special to your mom, your dad, and even your teacher. It does not matter. Saying that reminds me of when I was four and the middle child was born. Everyone fussed over her and payed attention to her. I was wondering why she was so special. All she did was sleep, cry, and eat. She was not that interesting. As I got older I realized why everyone fussed over her. Everyone looked with their heart and found out how precious she was. I looked with my heart and found I was proud to be a big sister. I think the quote means that if you love something or someone, you don’t get a chance at seeing what is special to someone else. For example, if you have a baby brother, two or three months old, and you love him, you can’t really understand what’s special about another person’s brother, because you already have a special brother. The brother. And it doesn’t have to be family members , either. That special thing can be something like a blanket or a teddy bear from your childhood that is special to you. Your friend might have a different childhood item that is special to them, but you don’t understand why it is special to them because you already have a childhood item that’s special to YOU. I think that this special item can be anything, really, to a special book to a car or a home to a special tissue box. Your friend might have a special dad, but you do too, and you can’t see why his is special because your dad is special to YOU. Well, Antoine De Saint Exuphery wanted to express that by making the flower special to The Little Prince to tell us that true seeing comes from the heart, not your eyes, and that what is special to YOU, is different for another person. You might have a special flower, but the Prince does, too, and his is more important that yours because it’s special to him, and you think the opposite. You think your flower is more important than his because yours is tamed to YOU, like the Prince tamed the flower. that if you love something or someone, you don’t get a chance at seeing what is special to someone else. I agree i think my sister is very special and when i look at some other little sister of someone else i don’t think they are as special as mine. The quote:”One sees clearly only with the heart, anything essential is invisible to the eyes.”, means to me that a person’s good is what you see but the bad just goes away like it’s not even there. If a family member of yours had a disease and everyone who didn’t know about it, tried to look for the good in them. Just like you do when you’re around them! See, my sister has a studdering problem. Some people laugh and some people look for the good and ignore that fact just like her friends and family do. Even to strangers, they hear her speak and they just know. So they don’t point out the bad things (some people do though) they ignore that and get on with it. They look for the good and that’s what matters!! When I see people that know have disabilities, or a disease, or cancer, I ignore that and make their day by making them feel welcome or happy. I don’t look at the bad, I look at the good! But some people think that their special and in a different way than that they have a disability. And it’s not that their not special, which they are it’s just that they don’t think like they should. It’s a horrible feeling when you don’t feel special, to them you’re just some ordinary person. i totally thought the same thing. To me, it means that if you make fun of them and don’t really know who they are is bullying. Many people have conditions people don’t know they have. One time i was in a store and one girl scars all over her face. Some other people kept laughing and pointing at her. I felt so bad for the girl, she may have gotten hurt or was in the army. Like my grandma, she has lupus and she can’t walk right. When she was still in school people made fun of her until she stood up to the bully. If you really don’t know a person on the inside, and you just see the outside, it’s not right to make fun of him/her. You should always think about the inside. I think this means that if something is special or the best in the world to you then it is. I think this because allot of people or kids say that their mom is the best mom, but other people or kids wont think the same they think their mom is the best. It doesn’t matter what other people think it is what you think. Another example is if someone says my dog is the coolest dog every that is what that person thinks with their heart and not their eyes. The way people think or see with the eyes is if they see a a banded, old, nasty sick dog walking down the street they don’t want to help it because they are thinking with the eyes not the heart. Some people might see the dog and they want to help it, that is because they think or see with the heart. These are some ways or reasons i think the fox said this for. At-least one time or more you will think with your eyes and not your heart. To me it means that if you don’t know the person it will just look like all the other people that you don’t know. That a tree will just be like another tree unless you make it your tree than that it will be a tree you have made a bond with so than it will be the only tree that you will know by looking at a different tree you know its not your tree so you will be going somewhere else to look for that one tree that you know is your tree. Then when you find that special tree than you will see the difference between a friend and a phoney so you don’t go and make a wrong friend decision and they end up making really bad choices that lead you to destructive consequences and lead you to a bully or worse a hand to hand combat fight that ends up with the cops getting involved and then nobody wins or losses because they both go to a bad place that you really want to be so all you have to do is look through your heart and not your eyes and choice the best friends and enjoy the time on earth because it doesn’t last forever. I think that the quote is amazing. To me the quote means anything that is important can only be seen through your heart not your eye. That means that you can not see that some one is caring with your eyes. You can only see it through your heart. One example is the files. The office has these. They look at your files to know more about you. In the files it says stuff about you. You can not see the best thing about with your eyes. You can only see that with your heart. Another example is when you first meet a person. You can not see with your eyes what is good about that person. You have to know them in order to know that. Once you know that, then you have to see with your heart what is good about that person. To me it means that somethings that you can’t see with your eyes you can see with your heart like in love. In other things sometimes it is more important to see it with your heart then it is to see it with your eyes. That is just the way life is . It is just suppose to be that way because it helps you understand more things clearly. It also means that seeing it with your heart can be just as equal as seeing it with your eyes. Sometimes it is more important to see it with your heart then with your eyes at certain times. It just depends, what kind of person you really are. It makes you who you are right now. To me there are multiple answers in one question because I use my heart to answer questions to. Because of that it lets me tell more about everything i could answer. I think that it also means that it could be easier seeing with your eyes then your heart. But with your eyes you just see the outside. But with your heart you see the inside of people or other living things. All that the fox is saying is that if you love something or you have a good tie with it then you wouldn’t be able to compare it to others of its kind. Like if you put the fox with a bunch of other foxes then the little prince would be able to find it out of all the others. “One sees clearly only with the heart. Anything else essential is invisable to the eyes.” The lonely fox said to the lonely boy. This quote is now one of my favorites because it means a lot. I think that the quote is saying that everybody that you might not know is the same in a way. But, the people who are very close to you are very different, even though they were once a stranger to you. One of my best friends was a stranger to me in the beginning of the year. Everybody can trace back when your best friend was a total stranger. That’s what the fox is saying in this quote. He’s explaining that once you really get to know someone, you can point them out in a crowd or a word can trigger an inside joke. This quote can also mean that you might like someone so much that you can’t “see” anyone else but them. They are so important to you that the things that you see or do aren’t really important. It is saying that you should follow your heart and don’t follow what you see. I believe that this quote says things about peoples everyday lives. It’s like saying “It doesn’t matter how you look, what clothes you have, or how much money you have. That shouldn’t make you cool or popular.” It reminds me of that because of the fact that it happens a LOT in other peoples lives. It’s probably going on right now, people thinking they’re cool because they wear Hollister or PINK. Well it’s not cool, it’s just a name. People in other places judge each other by the way they look. That case-scenario reminds me of the saying “Don’t judge a book by it’s cover.” I think this because people will walk down the street and see somebody with torn-up clothes. They will probably instantly judge the person. They won’t care why or how they were ripped but they will just think. “Oh that person’s probably poor so they aren’t cool.” If anyone thinks that on one glance at a person, that is just disgusting really. So think to yourself, “They could probably be having a hard time. I should just see if anythings wrong.” instead of judging the person right off the spot. this means to me that you cant see every thing with your eyes. You cant just see what is in your view. you have to look with outer things like your heart, because the most important stuff might be right in front of you but you cant see it with your eyes you have to use your hart. just like in the book when the business man owns the stars he just look with his eyes. the definition of own when you look at it in the eye way is just to have something. but when you look at the word with you heart the true meaning will be reveled. the true meaning is to love it and care for it not to sit at a table and count how many you own. it is same for all of them they just got to use there heart to find it. almost every body that he meant look with there eyes if they just looked with there heart there life would have been different to there life’s. Everybody who did see with there hart made an impact on the little prince. This comment means a lot to me. To me this means that you really never let something go that you love. This happens to people a lot in the real world these days. It usually happens when your favorite toy breaks or someone close to you is leaving. This happened to me when my aunt left and went to Texas. This also reminds of many other things that have happened in my life. Like when my cousin went to war in Iraq, I was excited when he came home. It also reminds me of the time when my cousins moved down to Georgia and they haven’t com back since. What this comment means to me is that your loved ones really never gone as long as you have something to remember them by. Just how I remember my cousins and aunts and uncle. I think that the quote means don’t judge a book by it’s cover. I don’t think it’s right that people get judged by the way they look and not what their personality is. So when it says “One sees clearly with the heart….” I think that that means only one person can see whats underneath and all of the others only care about whats on top. A piece of cake reminds me of this quote because not a lot of people eat the cake they might only eat the frosting, but one person is willing to eat the cake not only for the frosting but for the whole thing. I’ve seen this happen on a video that someone had posted on youtube of this girl that was doing a cool thing, but everyone was commenting on it saying bad things about her appearance and not about what she did. The prince and the fox think the same but in different situations.When the prince said the flower was special to him because he loved the flower. If there was 50 different flowers lined up together with his flower next to them he would be able to tell the difference between them because he loved that one specific flower. The fox has a different situation. He wants to be tamed. The fox wants the little prince to tame him but the little prince doesn’t have time for that. To me that means if someone is willing to do good has a heart. But someone who is not willing and just thinks about themselves and not other people doesn’t have a heart they’re just cold,like they don’t care about anything. EXAMPLES: if some person like a friends parent has cancer and u want to visit them all the time and bring them get well soon gifts then you have a heart. But if your friends mom died or something and you could care less then you don’t have a heart, your just cold. I think the quote means that you don’t see with your eyes, you see with your heart, it’s like how blind people work, they can’t see, so they see with there eyes, and they try to find out how your face looks like with there heart, and then you know who that person is, you know because it’s special in a sort of way. You know that person is special because they are special to you. Thy may just seem to be another person in this world to some other people, but that’s not how you think they are to you. And you don’t know what you see on the outside, you know what you see on the inside, you know that person is special for what ever reason to you, and that is what is important. In the story, the fox said that he wanted to be tame, that means that he wanted to not just be in ordinary fox, he wanted to be something more, something more special, that is what all of those words mean, if you want yourself or someone to be spacial, you have to have a reason for them to be special. To me the quote means that if you see with your heart then it stays with you but if you see with your eyes then it doesn’t stay with you as long. For example if i look at a beach ball with my eyes then I will not remember it for a long time. If i look at that beach ball with my heart then i will remember it for a long while. I the story the Little Prince, the Little Prince remembers his flower and loves it and always thinks about it. So this means that he is looking at his flower with his heart and not with his eyes. Also his mountains he always remembers those so he sees them with his heart. A few things that i see with my heart and not my eyes are…. My mom and dog and dad. Also my house and my room. I love all these things i never forget them which means to me that i see those things with my heart. The first part in the book means to me that, you can see something that no one else can. You can see the important things in people, or other items. The second part, to me means, with your eyes, you see the wrong thing. You see how someone looks and dresses, you don’t see their true personality you want to see, you don’t see the important things. An example would be, say someone new has moved in and they go to your school, you want to make them feel good but they look like a dork or someone YOUR friends wouldn’t approve of. You see he/she with your eyes right now. But you get to the person a little better outside of school and you see the true them, you see their real personality. The real deal. Also, if someone has a disability most people try to ignore that person and be mean to them because of that disability. Just because someone has on arm, or one leg or even in a wheel chair, you think they aren’t as good as you are because they can’t do the things you do, or can’t be around the people you do. That doesn’t matter. What if you were that person? How would you feel if someone made fun of you or talked behind you back? You wouldn’t like it would you? It’s like in every movie or t.v. show there is, there is always a bully, and always someone who gets picked on. That is how it is in the real world. Those bullies don’t see that that boy/girl they make fun of sitting in the lunch room by their self can be great at sports, or cheer, or whatever the “popular” kids do. They wouldn’t know that because they only see what is on the outside, not in the inside. So what i think the quote means is, don’t look at what is on the outside, try and find what is on the inside. Don’t let someone’s looks let you stop them from being your friend. I think that the phrase in The Little Prince means that if you see things that are very important to you then nobody could stop you from doing what you would want to do. The second phrase means to do anything that is very important to you because absolutely nobody could stop you from doing what you would want to do because even your parents can’t stop you. These are all of the reasons why I think that the quote in The Little Prince means that you could do whatever you want to do. i think that the quote means that if something you love u can only see with your eyes than you really dont love them at all. it has to be inside your heart. no other body parts. Just like with my family, i love them with in my heart not with my eyes. If i was blind then it wouldnt make a difference. My dog,Cubby is my little brother, we do everything together. And i can tell that he loves me back. Even when he dies he’ll still always be inside of my heart. The saying: ” One sees clearly only with the heart, anything essential is invisible to the eyes’. To me the saying means that some people are special to you , but to other people they don’t think the same if they don’t know them. For example: Lets say you care a lot for your family and there special to you , but to other people there just some person they don’t know. In the book The Little Prince , the prince loves his flower so much and no other flower he care for more than him rose. Nothing else is better than his rose to him he loves it so much and cares for him so much. That what the first part of the saying means…( ” One sees clearly only with the heart. So that’s what the first part means in the book. To me my friends and family are really important to me and to other people there just random people. In the book the little prince tamed the fox and after that he left and the fox even though they had a special relationship . Before he left he told him his secret and he told him there friends but he cares for his flower more then him. So I think that people are friends but some people are way more important. I think the quote means anything that detailed or important lies in the heart. I say that, because loving or cherishing the little things are fun and great and being happy. Don’t give up on little or important stuff love it and have fun with it. The essential part of the quote means anything bad or not good cannot be seen by the eye’s. Or just don’t bother with it. It may go away,it may never or may return. But just don’t bother with it. Sometimes it will be good. But not good enough. I think another version to that essential part was.Don’t be a grown up! Don’ take stuff the simple way! Don’t look at it and think the simple way. Be imaginary, have a fun mind. I think that the quote means that It’s very special. And it’s valuable of what you can see and feel. The quote is very amazed to some people. The quote is more of a trusting feel.You trust your instincts. You look for the best in others, while they can be nice,mean, or whatever. Acceptance is a big part of this quote. You don’t usually always think of the bad in others. You want to the the positives. My cousin’s uncle has cancer and we just found out about it last night. It’s probably going to be awkward seeing them all because we always see them at family parties at my cousins. This quote can easily relate to any sickness ,etc. I’m obviously worried about him since he is in his 30’s and recently had a kid and one is on his way. It’s going to be different being around him knowing that he has cancer and there is noting that we can do besides give him support. I’m going to look for the good in him and any other people who might have any type of sickness. Seeing things that happens to other people are sad and hard to think about when you know it’s serious. When I see someone with a serious condition, I feel really bad because it’s horrible. But im sure keeping there heads up is a great thing to do. Not worrying about the things that aren’t that bad, are better. “One sees clearly only with the heart anything essential is invisible to the eye” means that if it’s important to you it shouldn’t look cool or nice it should mean something. For example in school some kids are only friends because the clothes they wear or the way their hair looks. And sometimes that makes me mad but there is nothing I can do. An example in the book is the little prince’s rose is like the school thing because to the eye it’s just a rose t to the heart it’s your rose. So if you planted a flower and your friend saw it to them it’s just a flower but to you it’s your flower that you planted and watered. I think the quote says a lot in many specific ways. The fox is mainly trying to say you may think something on the inside with your heart, and mind but that something inside is meant to be felt inside can’t be seen by guessing or judging. That reminds me of that old quote,”Don’t judge a book by its cover” but in this book the fox is saying don’t judge something,someone, or somewhere just because you don’t know or understand it. The little prince wants to say the Earth is the worst place in the world because he can’t find anything. But the fox tries to tell the little prince that it isn’t really that bad once you get use to it. I always use to judge people by how they looked, and how they acted,and so did some of my friends but i realized, that was wrong. My friends and I just got so tired of it and when we gave people a chance, it helped. We had a lot more friends to hang out with. Now all of us hang out almost everyday after school or on the weekends. And we all realized if we think someone’s mean or someone’s a loser, we just think that we’re the ones being mean or being losers. The lesson that the little prince needs to learn is not to judge something about how it is, or how it acts without knowing the full effects. The fox is trying to say how good things can be if you give them a chance. I’ve learned that mistake of not seeing something or someone how it or they really are first. And the little prince is trying to make that same mistake too but the fox is trying to stop him from making that decision. To me it means that when you love a topic something else you really spend a lot of time on that topic but not anything else.Like if someone likes math they will study hard in it and will get good at it then when it comes to science they are lost and don’t know what to do because you spent all your time studying math. Also what the fox meant is that the rose might be just a rose but its your rose and there is no other rose like that rose so you should cherish it forever. Another example is that if a kid gets a bike but another kid gets the same he shouldn’t complain because it is his bike and he should care for it. .I think this is what the fox means. Some examples are the I SAT test people they only care about the test scores not how much they improved over the years of being a student or how they did on last year I SATS.I also think some parents are like this too because all they care about is the grades not what they went up in their subjects.This is my three paragraphs on the quote. This is a very important quote to me. It means you can only see things that mean something to you. And you need to see people for who they really are and what is inside of them. You aren’t supposed to judge people on whats on the outside, and try to get to know who they really are. Also to always look for the best in others and not their bad side. This quote means a lot for many people not just me. I think this author meant to put this quote in that spot. It was at the perfect quote for this book because its a simple quote but its a confusing. To me it goes good because the book is simple but its confusing you have to keep reading it or discuss it to understand it. ” One sees clearly only with the heart. Anything else essential is invisible to the eyes.” What this mean to me is that is that u should always use your six senses. This is like bay blade that i watch in the morning and how this one dude keeps telling him like there’s a puzzle that he has to find to beat L-drago. Also how to defeat a enemy is to overcome the enemy. Another this that it could mean that you always should follow your heart and look what is around you. And there is another show that I watch that it says “What you can do tomorrow can be done today. ” That is some shows i watched that deal with sayings. There are many ways to say what is that mean. The last thing that it means is that one can see but the other one doesn’t. And that deal with people with glasses that don’t have it on. There are many things that have the saying ” One sees clearly only with the heart. Anything else essential is invisible to the eyes.” Also the last thing there is that there is always a wise man but there can be more wise people then one. The quote say that “One sees clearly only with the heart. Anything else essential is invisible to the eyes.” It means that you can not always eyes but you can see through the heart. That is what it means to me. An example of that is when you see someone who sitting by themselves you can go sit next to them. And just say a simple hello. That would be an example of that because you can’t see what you are doing but you can feel what you are doing because you feel better about yourself. Another is when someone has nothing to do or anyone to talk to go over and tell them that they can come over and sit with you and talk for the free time. That is something only the heart can see. The first line means that u see things with your heart and not your eyes. it relates to us to a lot. Like your parents love u a lot because your their child and you cant see that with your eyes but you could feel it with your heart because you know that they care for you a lot. The second line means that anything that is important to you you can see it. If a story is important to you you cant see it through your eyes. The meaning means more to your heart than your eyes. If the meaning was to your heart it wouldn’t be another sentence in the book. What the quote means is that we see more important things with the heart than with your eyes. In the Little Prince, the quote “One sees clearly only with the heart. Anything essential is invisible to the eyes.” Personally I think it means that if you meet someone new, the good things about that someone stay in your heart and never leave. If you look at the quote, you could see that when they say “Anything essential is invisible to the eyes,” it means that the bad in a person just disappears like they never said it. In my opinion, I think the author put this quote in the book to confuse you. But to be honest, at first I stumbled but then I realized the Fox was trying to say to The Little Prince that he shouldn’t look at him on the outside but instead on the inside. He probably said this because he wasn’t tamed but he was nice. If The Little Prince didn’t look at the outside of his rose, then he would of known that the rose wasn’t actually good. He would of also known that the rose was bad for taunting The Little Prince. Most books and movies have bullies in them too just like The Little Prince. For example, the TV show Pretty Little Liars has many bullies in it that secretly taunt the four main characters. In other books too like To Kill a Mockingbird, characters treat the main character not by looking on the inside, but looking on the outside. Real life situations also include bullies. For example, my cousin has a studdering problem and some people make fun of her and some people don’t. Whenever we go to a relative’s house, they also look at her with their heart but when we go to the mall people look at her with their eyes and laugh at her. My other example was that when a family member is sick don’t make them feel bad just talk to them the way you would if they weren’t sick. They are still the same person. Some people don’t touch someone who is sick because they don’t want to get sick well they are the same person who they were before so why do you worry about it now. That is what the quote means to me. I think the quote means that people like to see the simple things in life and the complicated things are just a big blur that no one likes. For example, when kids do their homework, they only like the easy problems and get it done with. The really hard problems are just so complicated that kids find them as just boring work. This quote might also mean that because there might be a big project in class and some people just like to do what they are required to do and that’s it. They don’t bother to put in much effort or anything special to get any extra credit. They take the easy way out and don’t bother doing anything complicated. This quote might mean that people take the easy way out of things. There are some people that sometimes just quit. They don’t give any effort into doing things they don’t want to do. For example, there are times when people are working at a presentation and they don’t do anything new. They don’t put in anything exciting or fun. They just slack off work and take it as a joke. However, not all people are like this. There are some people that are very committed in doing their work and doing well and that is what I think the quote means. I think that the saying means, you see who you know and care about. But you don’t see the people you don’t know and care about. There pretty much invisible to your heart and soul. That is what i think it is to me. It could also mean that your heart blocks out the people who are not inmportant to you. Those are the two possible things i think the saying could mean. So what do you think it means in your own personal opion. In the book, the little prince is going from plant to plant trying to find a freind. But on all the plants there is no one his age just a bunch of silly “grownups”. Soon he makes to earth but he lands in the desert where theres no people there. So he thinks theres no one on are plant or where aall just hiding. But suddly he meets a fox and the fox is trying to take him into tameing him. That is how the saying “One sees clearly only with the heart. Anything essential is invisible to the eyes” came about. I think the Quote means that when people or “grown ups” see with their eyes it’s like thinking that fun or business is the greatest thing in the world.They can not see the truth in the world that is real.They can only see the truth with lies and the truth is the quote.”One sees clearly only with the heart. Anything else essential is invisible to the eyes” is the truth. Everybody has different expeariences. So we have different times when we see clearly with our hearts and different times when we use our eyes with the important things in life. Using our hearts to see the world is easy to do when you believe that you can do it. The things that are necessary in the real world are the best things in life like people that care for you, things to do when you don’t have second thoughts, and a life that has had many great adventures. All of those things can be accomplished if you see with the heart and not with the eyes. When you use your eyes to dicide what’s necessary then you are diciding what is wrong. It is like Deal or No Deal. You have to think about what your options are. One option is to do what’s right and civil while the second option is to do what is wrong and unnecessary. If “seeing is believing” than people see what they want to see.The little prince is going back and forth with seeing with the heart and with the eyes. The fox has made think about what to do now. “One sees clearly only with the heart. Anything essential is invisableto the eyes”.